University of Maine's Harold Alfond Stadium. A linebacker who received scholarship offers from 10 Football Bowl Subdivision teams and decommitted from UCLA highlights a list of 21 players who signed National Letters of Intent on Wednesday to continue their football careers at the University of Maine starting next season. Two players from Maine and a highly-recruited punter and place-kicker also were among the players who accepted football scholarships from the Black Bears. The Black Bears’ recruiting time was shortened because they went 10-4, won the Colonial Athletic Association title and advanced all the way to the Football Championship Subdivision semifinals for the first time in school history. The coaches, who were directing the team in November and ran into a recruiting dead period (no contact) in December, had to scramble in January. Charlton said last season’s unprecedented success has definitely helped recruiting. “It definitely made Maine a very attractive place [to attend] and the staff worked hard and did a real nice job,” Charlton said. Kolin Demens, a 6-foot-3, 225-pound linebacker from Southfield, Michigan, received offers from Indiana, Kentucky, Maryland, Michigan, Michigan State, Missouri, Nebraska, Pittsburgh and Wisconsin, in addition to UCLA. The two-time, first-team all-state linebacker at Detroit Country Day School played this year at Avon Old Farms in Connecticut and helped the Winged Beavers go 7-1. Charlton said Demens decommitted from UCLA after they made a coaching change. Jim Mora was fired after the 2017 season and replaced by Chip Kelly. “We jumped in at a good time,” said Charlton, who called him one of the highest-recruited athletes in UMaine football history. Another linebacker in the class is Xavier Nurse (6-3, 206) of Brooklyn, New York, who joined UMaine for the second semester. He also received offers from FBS schools. Demens and Nurse will supply depth on a veteran linebacker corps and could see special-teams duty. 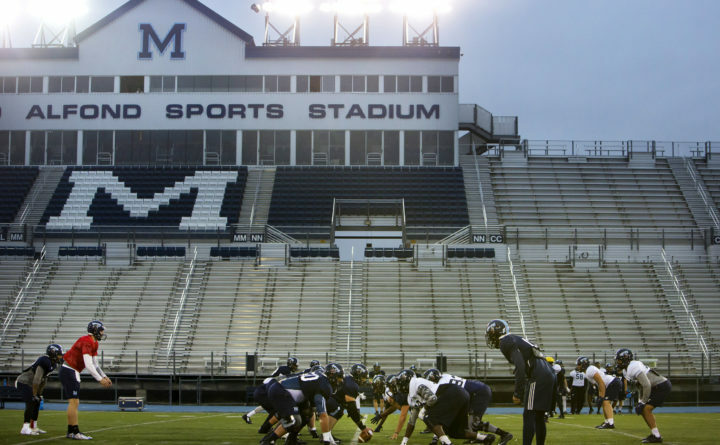 UMaine’s signees also include four tight ends, four defensive backs, three defensive linemen, two wide receivers, two quarterbacks, a running back, an offensive lineman, a long snapper and punter/place-kicker Brian Cooey from Blackwood, New Jersey. The Maine natives are Zoltan Panyi, a 6-3, 200-pound quarterback who led Scarborough to the 2017 Class A state championship, and tight end Jack True (6-2, 200) of Yarmouth. Panyi played at Bridgton Academy last fall while True was at St. Thomas More in Connecticut. Panyi completed 62.3 percent of his passes (63-for-101) his senior year at Scarborough for 1,444 yards and 19 touchdowns. He was intercepted just three times and he also ran for 574 yards and seven touchdowns. Charlton said recruiting in-state players is high on the priority list. Cooey, ranked the No. 13 punter in the country, will challenge Derek Deoul and David Gelb for that job and will compete with Kenny Doak for kickoff duty. “Our punting was fine but we need to improve in that area,” Charlton said. “There will be competition for all three jobs and that’s a good thing,” he added. The other tight ends are Kevin Falaki (6-6, 250) of Assonet, Massachusetts, Ori Jean-Charles (6-2, 225) of Monsey, New York, who transferred from Louisville and is already at UMaine, and Connor Zamiara (6-5, 220) of Rochester, New York. Tight end was another priority area because UMaine graduated both of its tight ends: Converted quarterback Drew Belcher and Julian Dunn. The four defensive backs are Robby Riobe (6-0, 180) of Everett, Massachusetts, Isaiah Gaynor (5-9, 184) of New Castle, Delaware, Satchel McKinney (5-9, 160) of Brandywine, Maryland, and Quincy Barber (6-0, 180) from Washington, D.C. The defensive linemen are Khairi Manns (6-3, 230) of New Rochelle, New York, Jacob Tuiasosopo (6-5, 240) of Waldorf, Maryland, and Bryan Hanly (6-0, 255) of Quincy, Massachusetts, who played at Bridgton Academy. The wide receivers are 6-2, 200-pound Clark Barnes from Brampton, Ontario, who was ranked the No. 5 Canadian player in the 2019 class, and Michael Monios (5-10, 175) of Montreal. The other quarterback is Joe Fagnano (6-3, 215) of Williamsport, Pennsylvania, the offensive lineman is Max Lovblad (6-7, 285) of Marsta, Sweden, the long snapper is Jake Maggio (5-9, 167) of Bridgewater, New Jersey, and the running back is 5-10, 190-pound Curtis Murray of Upper Marlboro, Maryland.